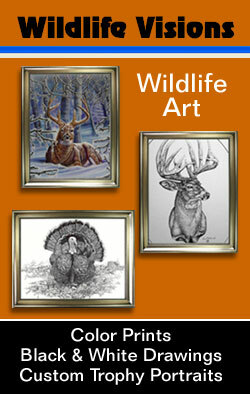 Wildlife Art You Can Wear! 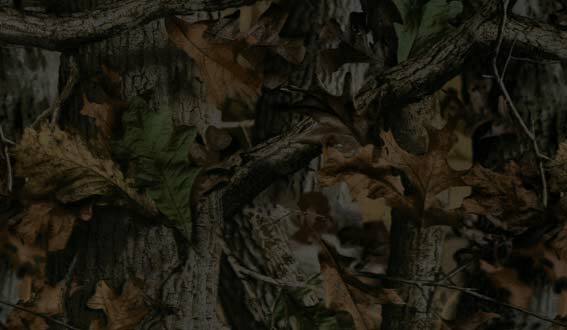 All Garments are made of a High Performance Fabric that is very comfortable to wear. 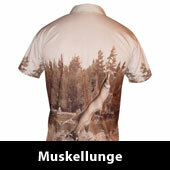 The Sublimation Printing Process ensures the Art is burned into the fabric so it will not washout, fade or peel off. 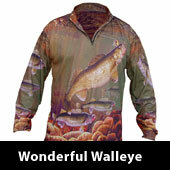 This long sleeved shirt features exciting images of Walleye fishing action on the front, back and sleeves. 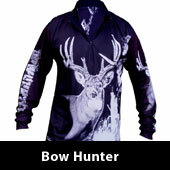 Price valid on sizes Small thru XL. 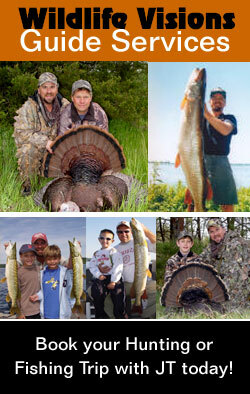 Addition cost for XXL and larger. 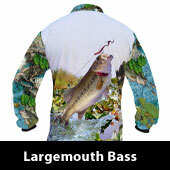 This long sleeved shirt features exciting images of Largemouth Bass fishing action on the front, back and sleeves. 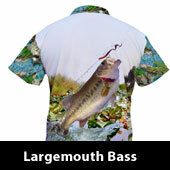 This short sleeved shirt showcases exciting images of Largemouth Bass fishing action on the front, back and sleeves. 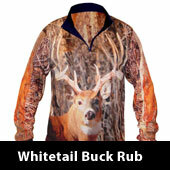 This long sleeved shirt features exciting images of a Monster Whitetail Buck on the front, back and sleeves. 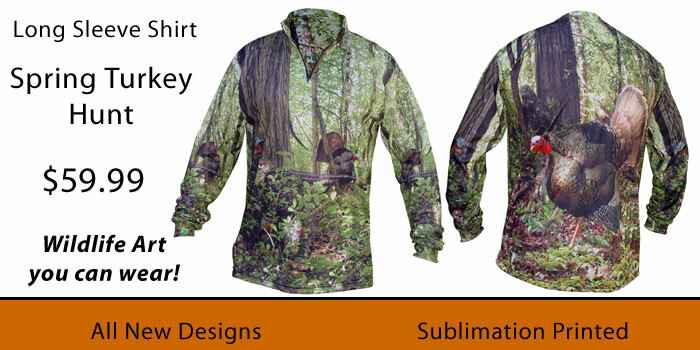 This long sleeved shirt highlights exciting images of a Bowhunter and a Monster Whitetail Buck on the front, back and sleeves. 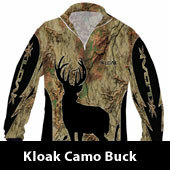 This long sleeved shirt features exciting images of a Monster Whitetail Buck Silhouette on Kloak Camo front and back. 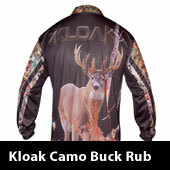 This long sleeved shirt showcases exciting images of a Monster Whitetail Buck on Kloak Camo front and back. 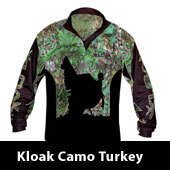 This long sleeved shirt features Silhouette images of a Strutting Tom Turkey and sucessful hunter on Kloak Camo front and back. 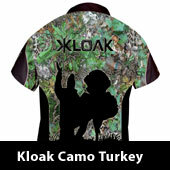 This short sleeved shirt highlights Silhouette images of a Strutting Tom Turkey and sucessful hunter on Kloak Camo front and back. 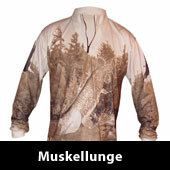 This long sleeved shirt showcases monochromatic images of a fighting Muskie on the front, back and sleeves. 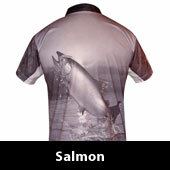 This short sleeved shirt features monochromatic images of a fighting Muskie on the front, back and sleeves. 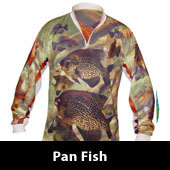 This long sleeved shirt highlights colorful images of Crappies, Bluegill and Sunfish on the front, back and sleeves. 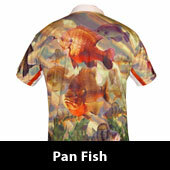 This short sleeved shirt showcases colorful images of Crappies, Bluegill and Sunfish on the front, back and sleeves. 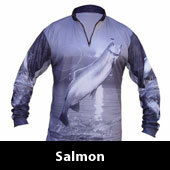 This long sleeved shirt features monochromatic images of a jumping Salmon on the front, back and sleeves. at sunset on the front, back and sleeves. 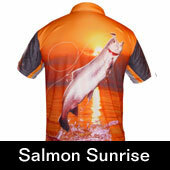 This short sleeved shirt highlights monochromatic images of a jumping Salmon on the front, back and sleeves. 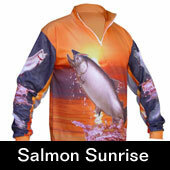 This short sleeved shirt showcases colorful images of a jumping Salmon at sunset on the front, back and sleeves. 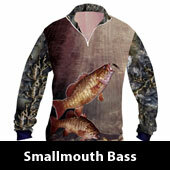 This long sleeved shirt features exciting images of Smallmouth Bass fishing action on the front, back and sleeves. 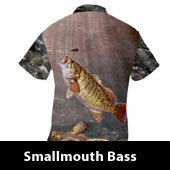 This short sleeved shirt showcases exciting images of Smallmouth Bass fishing action on the front, back and sleeves. 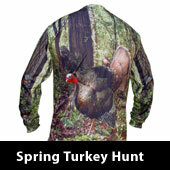 This long sleeved shirt highlights images of spring turkey hunting action on the front, back and sleeves. 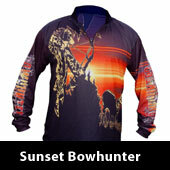 This long sleeved shirt features beautiful sunset images of a Bowhunter and a Monster Whitetail Buck on the front, back and sleeves.